It’s coming up to laundry day and you’ve worked your way to the bottom of your clean clothes and you pick out something that you kind of liked a few years ago or brought online and tried to convince yourself the fit was right and since its your only clean clothes you throw it on. For the rest of the day you’re self-conscious because you don’t really like these clothes. They aren’t what your into or how you like to present yourself. You finally do your laundry and you’re happily in your best until the next time you run out. Sound familiar? We live in a culture of consumption which is something we covered before and isn’t necessarily a bad thing, but a big part of that culture is the additive: more collections, more categories, more colour and variety. How many articles in mens magazines or blogs extol you to “build a better wardrobe” but nobody really tells you to dismantle your way to a better wardrobe. Maybe they should. Quality isn’t just what we put into something, if it was then Saudi princes and Russian oligarchs would be our arbiters of style. In fact, quality is as much about the the process of refinement, the deliberate choices made about what to keep in and what to leave out and this extends to our wardrobes. I always like to think about it in terms of travel, if I had to take only a duffle bag with me of my best items what would I leave out, and why? You can extend the scenario: a slightly larger bag, what makes the cut now? I had already taken this approach to my wardrobe and it was fairly compact but it was the chance purchase of Marie Kondo’s slim volume on organisation “The Life Changing Magic of Tidying” (US link) that really drove me to scale back. The titles a bit much and I’m not one for self help normally but a striking aspect of the book was how it deconstructed even a hardened hoarders arguments. 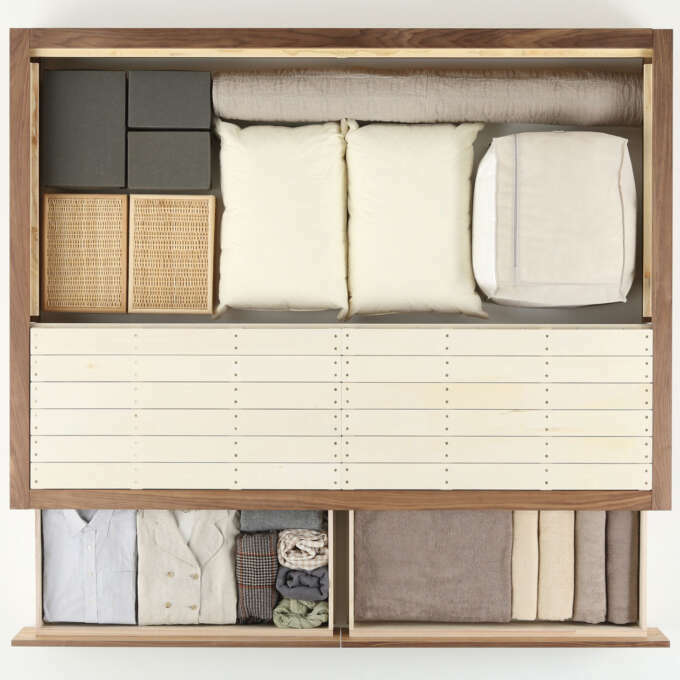 Japan's organisational pedigree is robust, from beautifully made trunks to modern masters like MUJI (whose brilliant storage bed is pictured here). The lesson of the book that hit home with me was the idea that we shouldn’t try to categorise our belongings by their utility, as utility isn’t the reason we care for our belongings and is usually a hypothetical construct in any event. If you discard the emotional attachment, the sense of financial loss and the distaste for waste and simply ask yourself “do I like this, does it please me to hold it” you quickly learn what you truly value and it becomes quite easy to discard the rest. In doing so you should be able to avoid those blah days where you’re unhappy with your compromised appearance. All your remaining clothing will be clothing you value, that you chose. 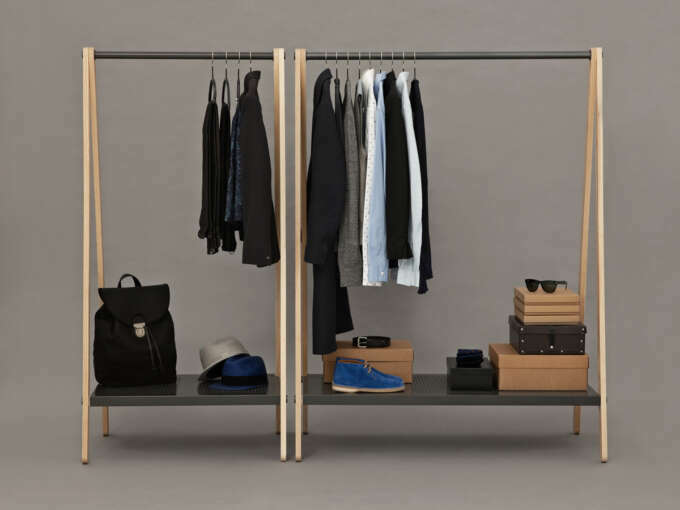 Normann Copenhagen’s Toj Clothes Rack. The other separate organising principle I’ve found useful is one which I’ve seen at use in the tiny apartments that most young people have in Paris—the clothes rack. In most major cities young renters are coping with apartments universally referred to as “tiny” but within that definition is a range from compact to shoebox and Parisian apartments are generally among the smallest. 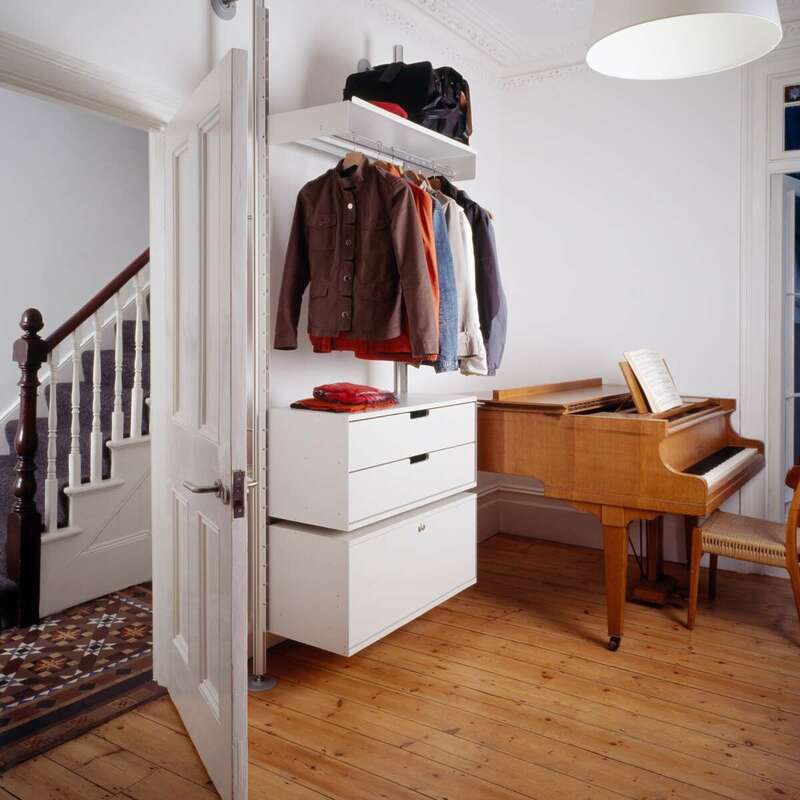 In order to make the most of the space they rarely seem to have built in storage or bulky cupboards and instead clothes are arranged on a rack. The advantage of this is that your unable to throw things in a pile on a rack, and a rack of course has limited space. The reality is that if you can’t edit your wardrobe down to a selection that fits on the rack you either haven’t really settled on your particular style (in which case you need to make some choices) or you have clothes that you don’t particularly need, and sometimes its both but having the rack gives you a useful frame for these decisions. An aggressive inventory of your clothing isn’t the most enviable task, but the upside is a sense of satisfaction and well being thats hard to match. If you know what you like and why you like it and surround yourself with those things then you’ll be less tempted to go for frivolous purchases and closer to having a style that reflects you. A final aspect of Kondos book that stuck a chord was her (particularly Japanese) emphasis that objects have a sort of spirit and identity and should be respected as such. So, although I’m advocating a clean out, the best possible outcome of all this is that the clothes you have kept are well taken care of, well preserved and lovingly worn.